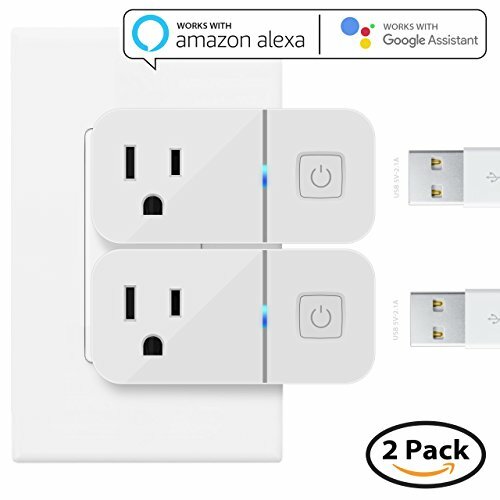 Maxonar Smart plug works on Alexa Echo Dot, no hub inquiry, no monthly fees, simple to setup and reliable on your stable wi-fi connection. The slim design for standard US three-pin power outlets, this smart plug mini occupies only one socket, leaving the 2nd socket free. This allows you to use an additional Maxonar smart plug in another device to work together. You can set no worry schedules for you lights and appliances from the smart life APP in your phone. Using the free APP, you can schedule a lamp to turn on at sunset, or set your TV turn off when it's time for your children go to bed, you can also set your social tools (facebook, Youtube, Twitter, Pinterest and so on ) notification by lighting up. Simply plug Maxonar smart plug into an electrical outlet, connect a device to the Smart Plug, and control your device wirelessly using a tablet or phone. Using the free smart life app, you can turn your devices on and off and set no worry schedules from anywhere in the world.